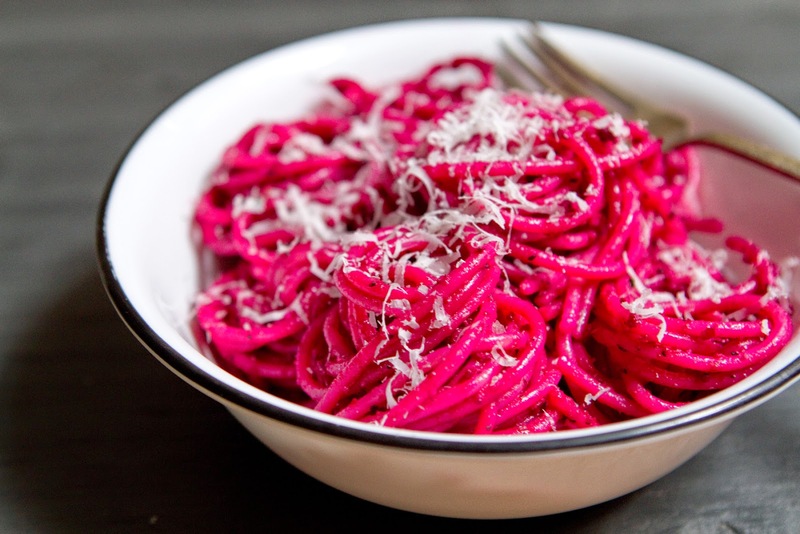 Hot pink pasta! Scarlet spaghetti! 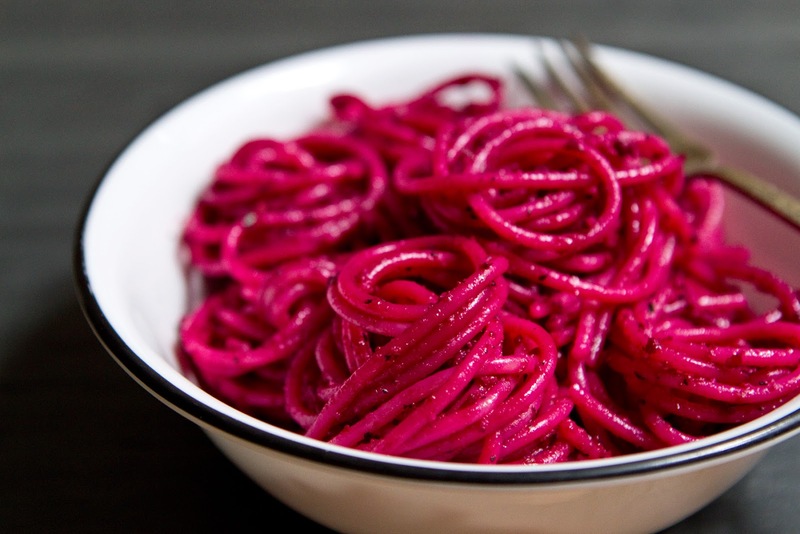 Neon magenta macaroni! 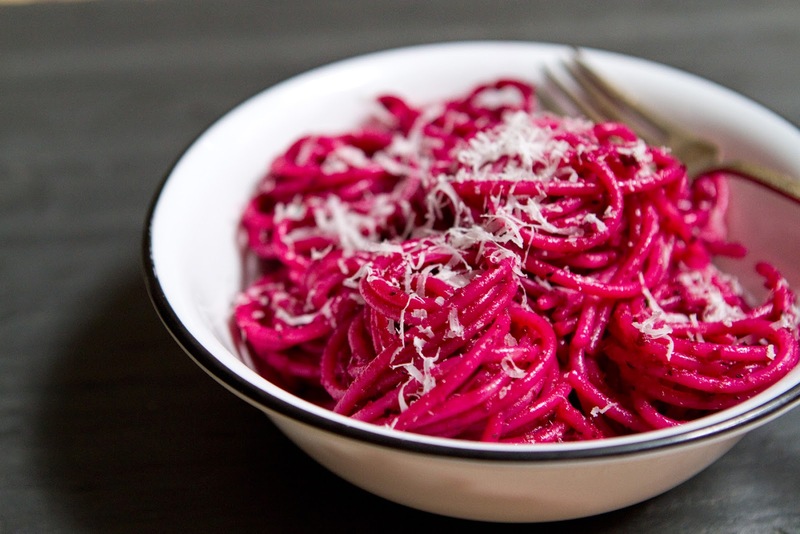 Fuchsia fusilli! Yep, this spaghetti sure is bright and eye catching. I used beets in an otherwise pretty traditional pesto recipe, and created this explosion of color and deliciousness. Beets are delightful, and delicious. If you've never cooked with them before they can seem just a smidge intimidating with their dark red color and rock hard raw texture. But they cook up just like a potato, and there are oodles of delightful ways to prepare them. Roasting is my personal favorite beet cooking method. Boiling is fine, but I love the dark, slightly caramelized taste the high heat of roasting lends to the beets. Pesto is one of my go-to weeknight dinners- just pop a bunch of ingredients in a food processor, turn it on, and you've got a fresh, flavorful sauce. There are tons of pesto variations out there using different nuts, or adding additional herbs or spices, but I wanted to change the base of the pesto, to add a whole new ingredient that would add body and texture as well as taste. The end result is a deliciously smooth and mildly earthy pesto I would happily devour any day of the week. 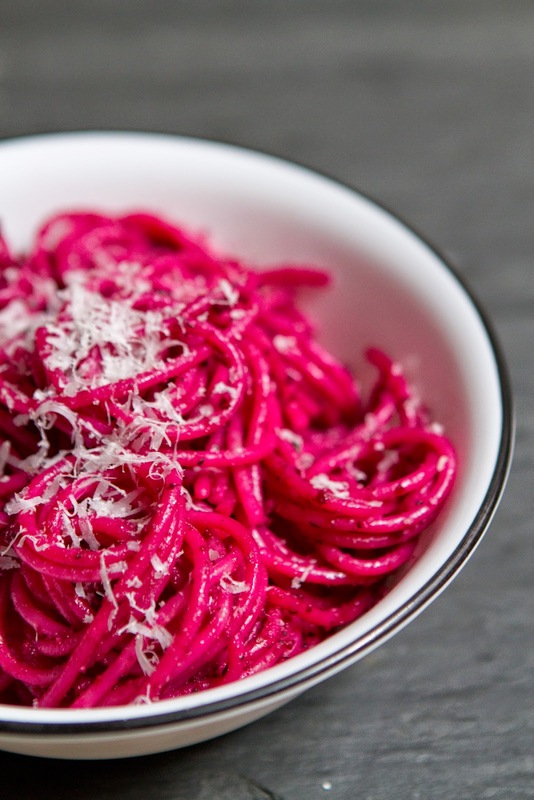 If you wanted to save time on this recipe you could easily roast the beets a day (or even two) before, skin them, and pop them in a container in the fridge until you're ready to whip up the pesto. You can also feel free to vary the kind of nut used. For instance, if you have walnuts or pistachios instead, I am sure either of those would be just as lovely as almonds in this pesto. 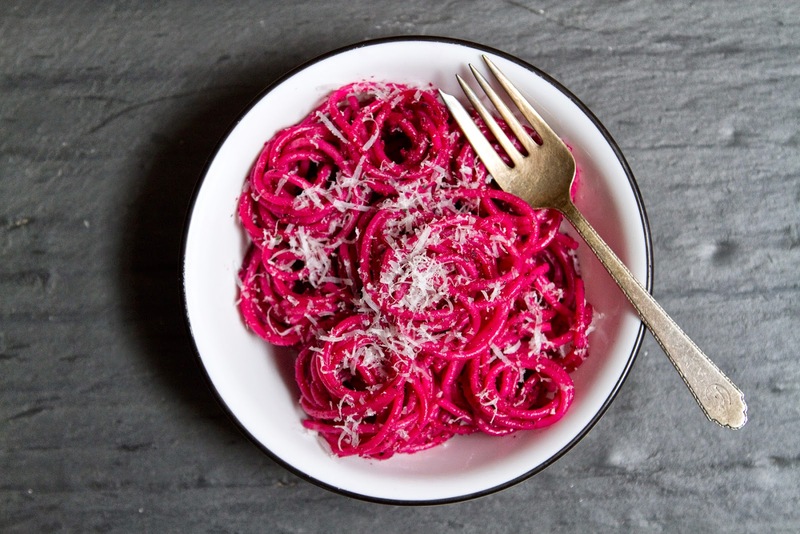 This bright pink pasta is so colorful, lovely, and delicious, it'll certainly please guests at a dinner party, and I bet children would be so taken with it's color they'd be happy to give it a try. Or you could make it on any old night, and turn a weeknight into a brightly colored dinner celebration. Enjoy! Preheat oven to 400F. Remove and discard (or save for a another recipe) the greens from the beets, wash beets, and place on a large sheet of tin foil. Drizzle beets with a bit of olive oil, wrap them in the tin foil and roast for 50 minutes - 1 hour. When the beets are soft enough to poke a fork in easily, remove from the oven. Fill a small bowl with 1 cup of ice water and one by one, place the beets in the water for a few seconds, then remove them, and the skins will easily slip off. Skin all 4 beets this way and set aside. You can do this the day before and keep the roasted beets in your fridge if you'd like. Bring a large pot of water to boil and add the 1 lb pasta. Cook until pasta is al dente, and drain in a large colander. 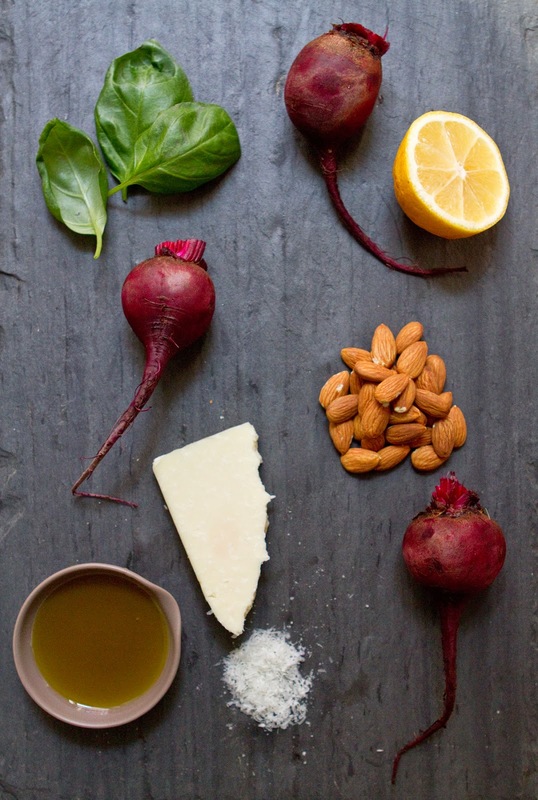 While the water heats up, juice the lemon, pop the beets in the bowl of a food processor and add the basil, lemon juice, almonds, grated cheese, and olive oil. Process on high for 3-4 minutes, until the pesto reaches your desired texture. I like mine mostly smooth, but with a bit of a grain. 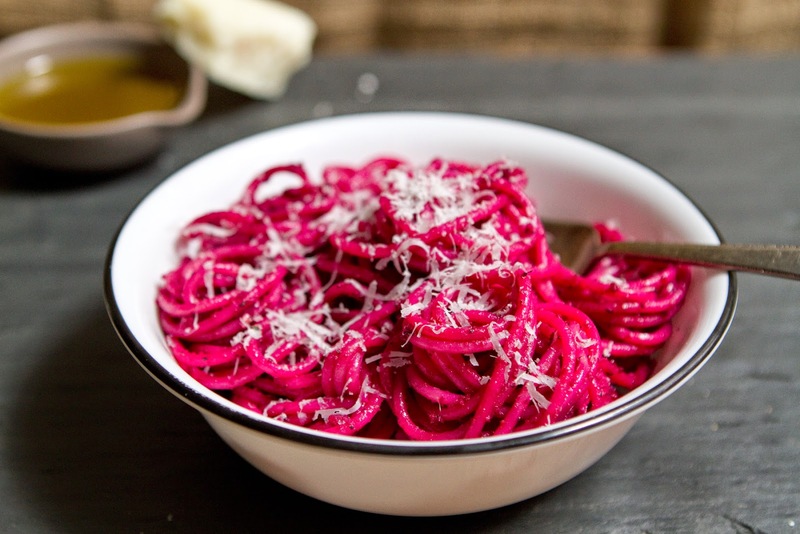 Place cooked and drained pasta in a large bowl or pot and add the beet pesto, toss until well coated. Serve with extra grated cheese sprinkled on top. This is very unique and mouthwatering recipe. I want to trytried this out. I’ll be trying this recipe soon. I hope it turns out great. Thank you for sharing.Too many assignments?Custom essays provide students with quality academic writing services, editing & proofreading services and whatever you need. Prices are very reasonable for your order guys.